The release of the offender who harmed you or a loved one can be stressful. 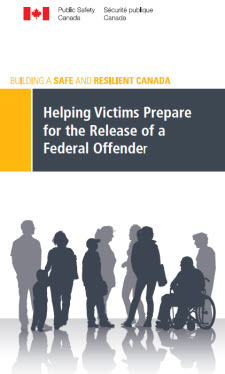 Here are steps you can take to protect yourself and your loved ones, and to help you feel safe and supported, when the offender is being reintegrated into society. You have the right to information about the offender who harmed you or your loved one. a copy of parole decisions. You must register with CSC or PBC to obtain the information above. Once you have registered as a victim of crime, you can also provide the name of someone you trust to represent you, if you do not want to have direct contact with either agency. As a victim or survivor of crime, you may have some concerns about the offender being released from federal custody into the community. To help you stay safe when the offender who harmed you or your family member is released, here are some things you might want to look into. You can ask CSC or PBC to put conditions on the offender’s release. For example, you can ask that the offender not be allowed to contact you, or not be allowed to be within a certain area or neighbourhood. Conditions for the release are not automatic, so ask CSC or PBC for them in writing, before the offender is released. Your written concerns will be part of the information the CSC and PBC consider to decide if the offender should have conditions on their release. Talk to the CSC Victim Services Officer or PBC Regional Communications Officer in your area for more information on this process. You should be aware that CSC and PBC must, by law, share your written concerns with the offender, before their parole hearing. If you have safety concerns you can advise your local police agency about the upcoming release of the offender. Police services can help in various ways to assist in safety planning. Start early and plan ahead for the eventual release of the offender. Local police and victim service agencies may be able to help you come up with a safety plan that works for you and help you to update it whenever your situation changes. Your safety plan should include ways to keep yourself and your loved ones safe both at home and in public. A safety plan is even more important when there are children involved. In some cases, if you or your loved ones have been threatened by an offender, you can request a peace bond. In Canada, a peace bond (section 810 of the Criminal Code of Canada) is a court order that allows a judge to place conditions on someone in the community such as: restricting contact with certain people or limiting where a person can go. If you think you need a peace bond put on the offender, apply as soon as possible and before the offender’s sentence ends. Once granted, a bond or an order can last up to 1 year. Please be aware that you may need to face the person who harmed you, in court, in order for a judge to grant a peace bond. A peace bond is not automatic; you must apply for it. Contact your local police, courthouse, or victim services for more information. Make sure you keep all records about the offender, whether from police, the courts, CSC and/or PBC. Keep track of any contact with the person even if it was through family, friends, or online. If the offender does not follow the terms of their release, or contacts you when they have conditions preventing them from doing so, you can report this behaviour to the police, or to CSC’s Victim Services Unit. If you are harmed by the person, or if you find out that they have broken the law in any way, report this information to the police right away. The records you have kept will be used to support any investigations into the offender’s actions and behaviours. People you trust – such as family, friends, neighbours, co-workers or community services — are a valuable resource for support. Build a network of people you can talk to about the situation to help you stay safe. In Indigenous communities, you may want to consult with the Band Council or Elders about your situation and options. You can feel more prepared for the reintegration of the offender back into society by considering the steps outlined here. Taking steps to access information and seeking support can help you continue to move forward in your healing journey.